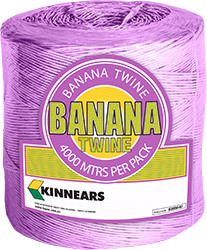 Kinnears Banana Twine is designed to assist in providing stability and support to growing banana plants during high risk cyclonic and windy periods of the growing season in Queensland. Kinnears Banana Twine is manufactured by Tapex, and is developed with high tensile strength. Available in a range of colours for clear identification, Kinnears Banana Twine offers high strength and guaranteed length. UV stabilised for superior performance in our tough conditions. Colour coded so you use the right product for the right application.